If you are coming from ANITA , then you are in the right spot. 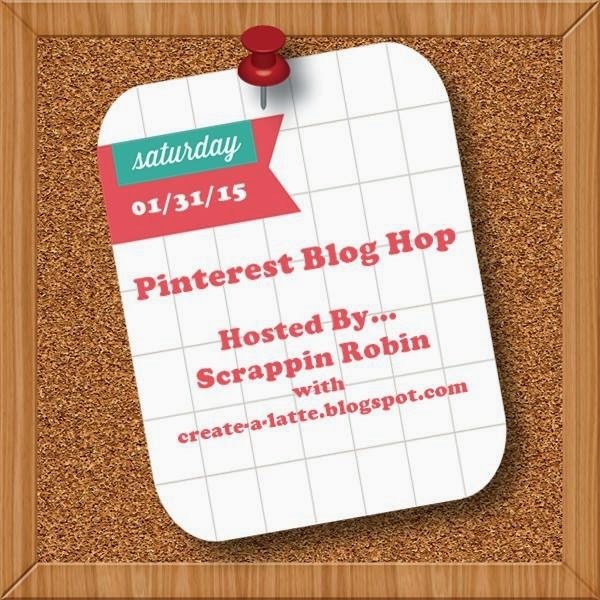 If you just happened to stumble across this post, please start at the beginning of the hop with Robin's blog...you won't want to miss any of the amazing Pinterest Inspired Projects! 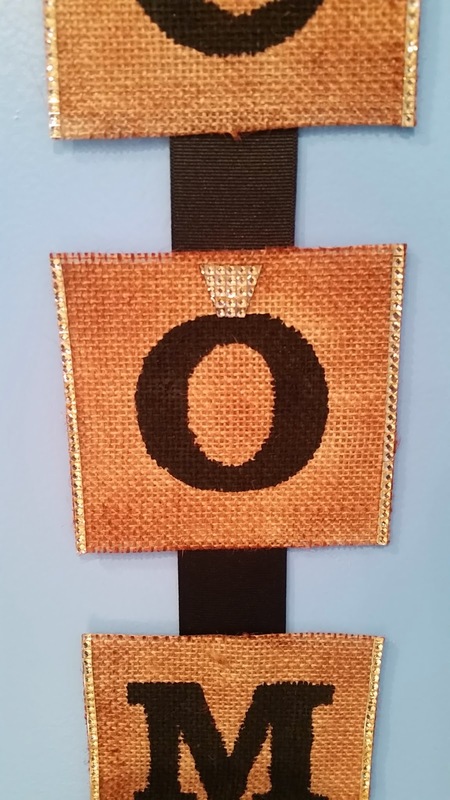 In addition to seeing some awesome projects, there is a chance to win some blog candy! To be eligible to win the blog candy, you must leave a comment on each stop in the hop as well as hitting that little "follow" button! Winner will be chosen on Sunday, February 8th so you have all week to hop through ! 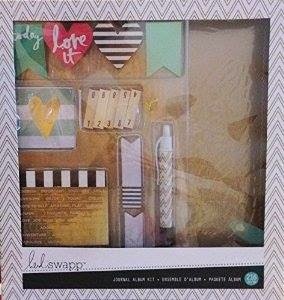 For this hop I am giving away to one lucky winner is this amazing Gold Planner Kit by Heidi Swapp. What better way to start off a new year with a brand new memory planner. You are going to love this memory planner! 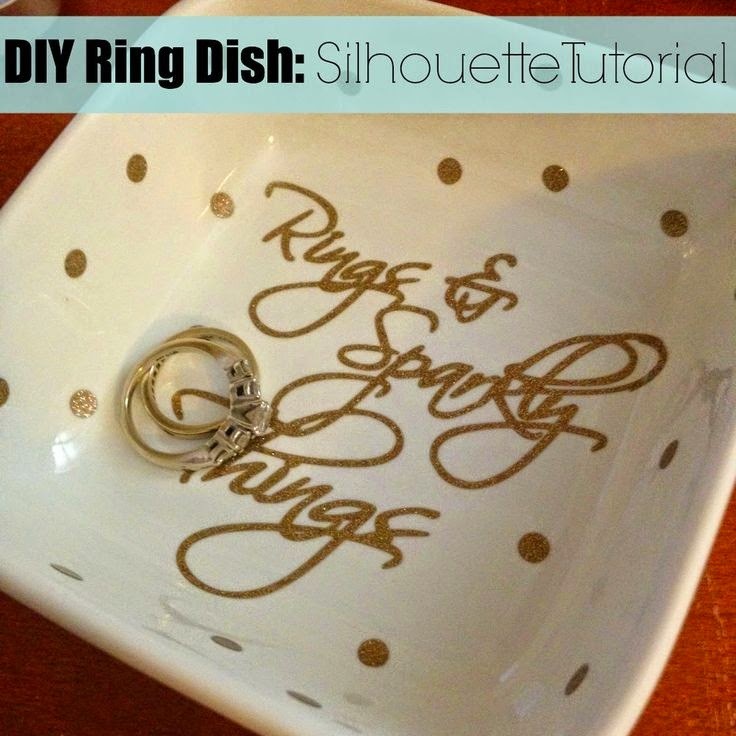 I found some inspiration on Pinterest after my friend lost her wedding ring. She would put it on the kitchen counter while she did the dishes. One evening, she forgot to put her ring back on. The next time she looked on the counter - it was gone! Long story short - the ring was in the trash on accident (thanks to her young son) and dad found it!! 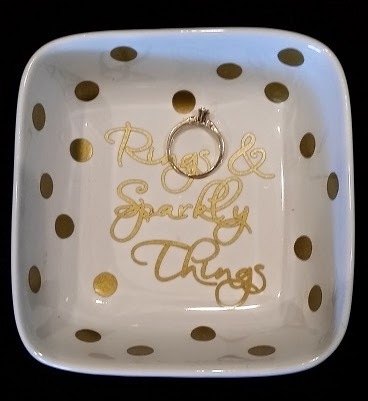 I wanted to make her a little ring dish to keep by the sink! Naturally, I went to Pinterest to see some ideas! 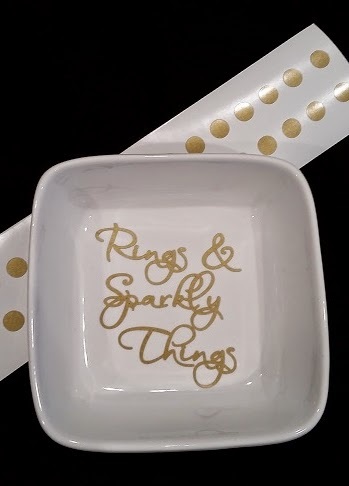 I loked the sparkly gold in this ring dish. The pin can be found HERE. I purchased two small square dishes/bowls from Target. I used a similar font from my computer and cut it out in gold vinyl. I also cut out some small circles in gold. I thought the dish looked a little plain without the dots (I was not a fan of the dots at first). 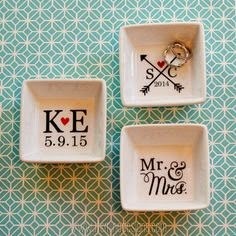 I also found another idea that would work well for a wedding gift. 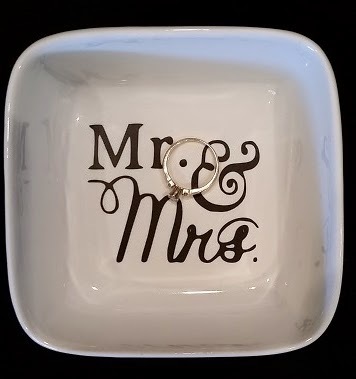 I liked the Mr. Mrs. dish. You can see this pin HERE. I cut this design out of black just like the pin. I can't wait to give this one to my friend's daughter for her wedding!! Your next stop will be with CANDACE! If you get lost along the way here is the entire line-up of today's hop for you to get back on track and not miss a single project. Today begins a brand new challenge at Frosted Designs - What Direction? You can show movement on your project, use arrows, use words that show movement (on the move, let's go) or use words that describe movement (north, east, south, west, forward). Easy Peasy!!! 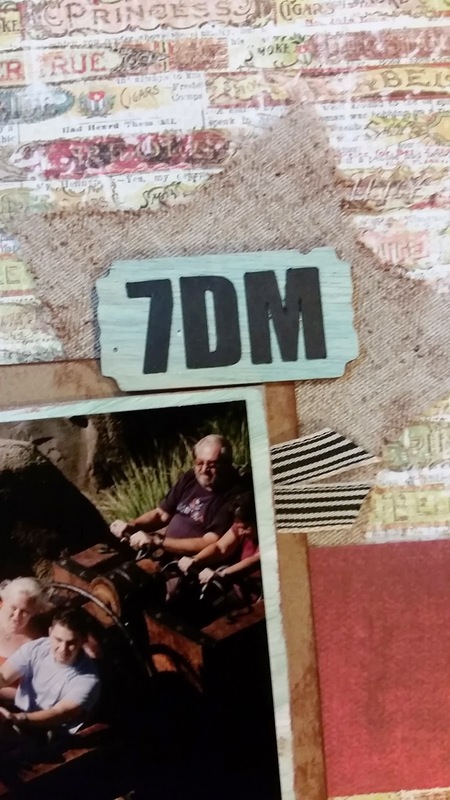 My layout is a picture of our family (all 7 of us) on the new Seven Dwarf Mine (7DM) ride at Magic Kingdom. The picture takes automatically and is linked to our magic bands. My husband is in the front seat in the dark shirt, oldest and youngest are behind him, middle and I are next and Mike's parents are in the last car. It was a fun ride, but I would not wait more than 20 minutes to ride it - would totally ride it with a fast pass. The ride is super short but extremely smooth! 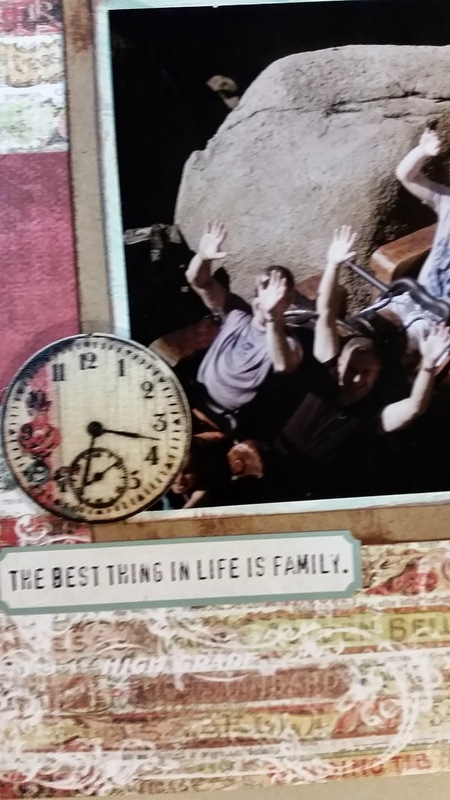 I used this sticker from the We Are Family kit. 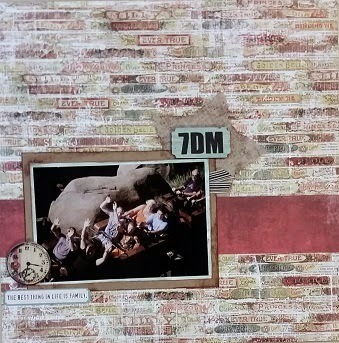 The paper and clock are from the Forever Yours kit. I used Juniper acrylic paint dauber to color my white photo mat and the wood ticket shape. I can't wait until our next trip to Disney to ride this one again!!! Hello again - another Wednesday, another sketch challenge at Let's Scrap Sketches!! I am getting my Disney layouts done with all of these sketch challenges!!! 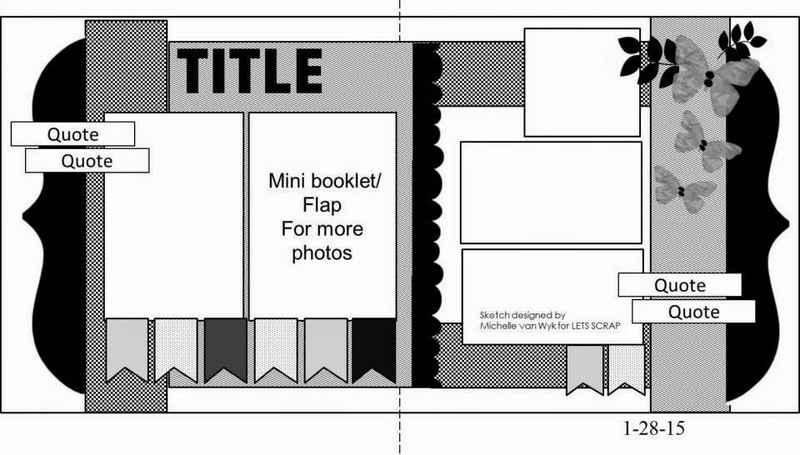 This week we have a 2-page sketch with a mini booklet or flip booklet for additional photos. I chose to scrap both pages (this is totally optional) and I made a pocket for four photos rather than create a flip book. I used busy paper so I left off some of the details from the sketch to keep it pleasing to the eye! 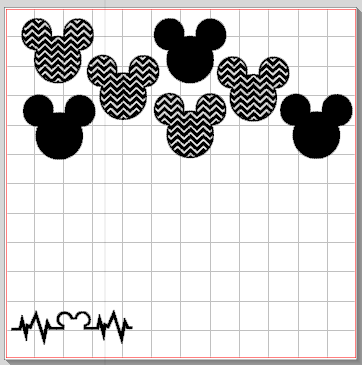 For the page tabs, I deleted the hearts that were on there and added tiny Mickey heads. Here are the additional photos. 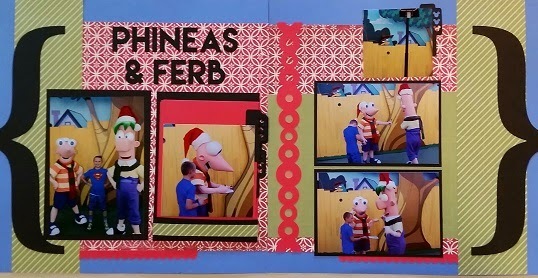 Phineas and Ferb are so much fun at WDW. They compete over whose page in the album is better!!! They spend a lot of time with each child! They are the only characters Tanner wanted to see besides Elsa and Anna and the character dining characters. I love the big title. 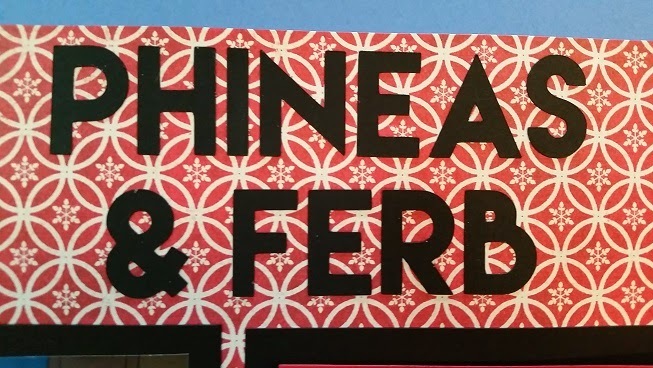 I used the font LEMON/MILK on my computer and black cardstock. The photo on the top right is Perry the Platypus peeking over the fence. He randomly peeks and then goes back behind the fence! I added the red border on the right page. 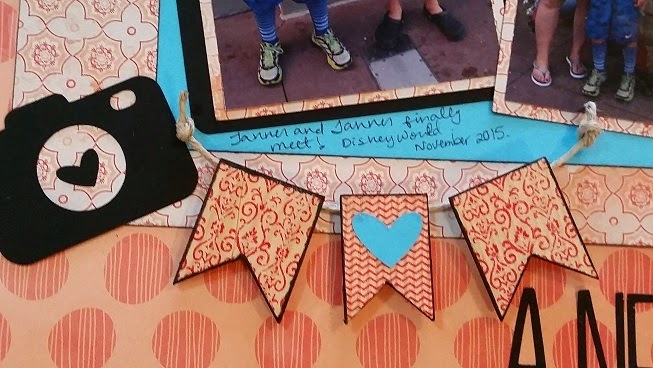 I trimmed the tiny scalloped border in half and tucked them on the bottom of each page. I was overwhelmed with this sketch at first. It took me a while to find the right papers, but once I had them I was good to go!! This year, the Book Fair theme is Under the Sea. They gave me a dark blue paper to make the window poster. Well, the dark blue looked more like a dark sky to me so I decided to add a boat bottom! I used some rolled white paper to make the boat form. 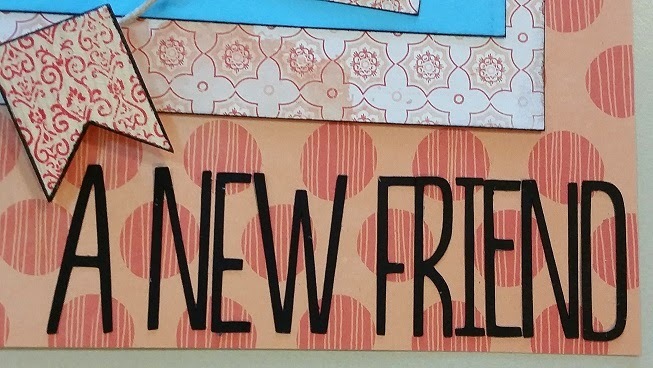 I trimmed kraft cardstock 3" wide in two lengths - 8 1/2" and 11". I inked the edges with Vintage Photo ink and adhered them on top of the white paper with my ATG gun. I trimmed the edges and adhered the boat to the poster. I added the Under the Sea letters on the bottom and seaweed on each side. I planned on adding other sea creatures but it was getting crowded and hard to read the words at the bottom. I found the sea creatures on my Silhouette Cameo - most of them came from the Silhouette online store. 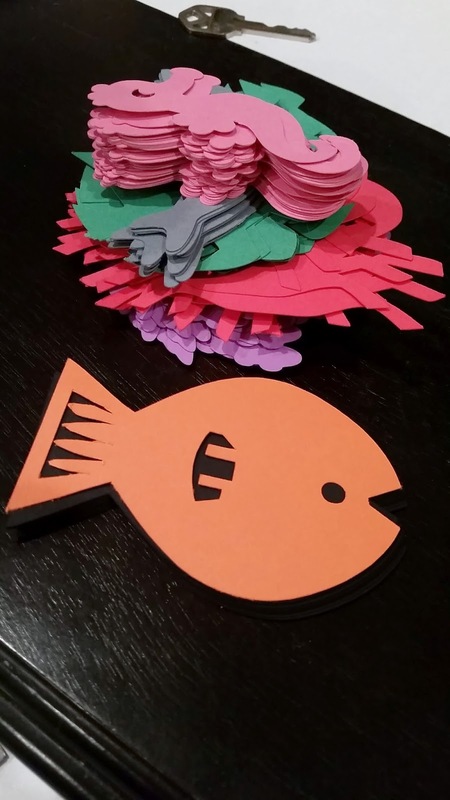 I cut some sea creatures 3" tall for our Media Specialist to use to decorate the library. Tanner wanted a Nemo fish - this is the closest I was willing to make!! 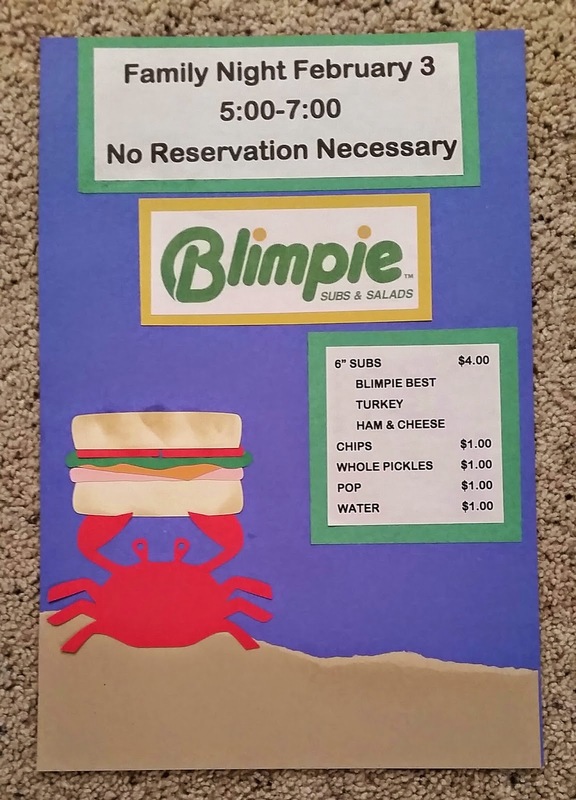 I also make 4 menu posters for her to hang inside the school. I wanted a sea creature holding a sub sandwich. 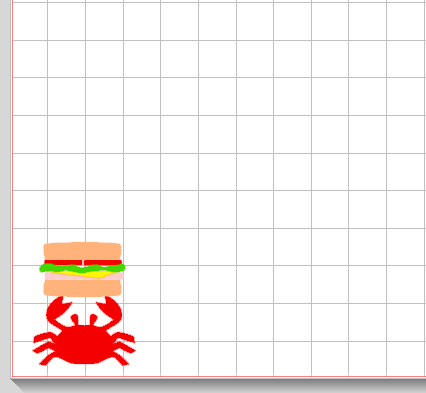 I used the crab and a hamburger. I used the bottom bun for both the top and bottom of the roll. I cut the hamburger patty out in pink to resemble ham. I cut the pickles red for tomatoes. I have to admit - creating the sandwich was almost as fun as making the boat!! Here is the finished poster. I tore light brown cardstock to look like sand. I inked the bread with Vintage Photo ink. 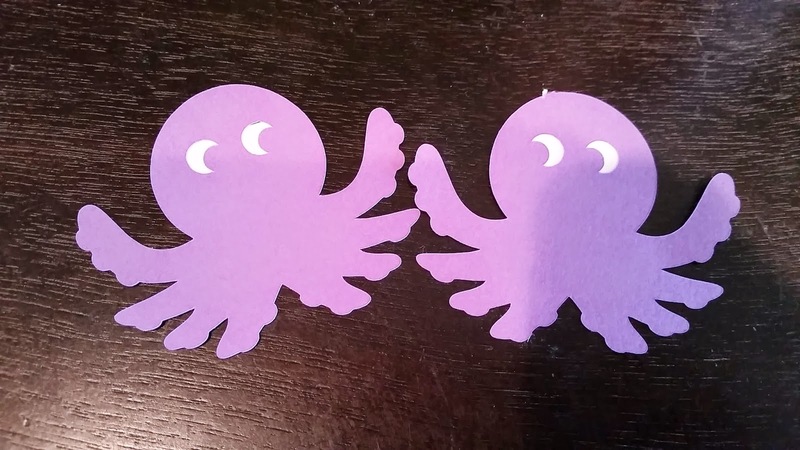 I love making these decorations every year for our Book Fair! 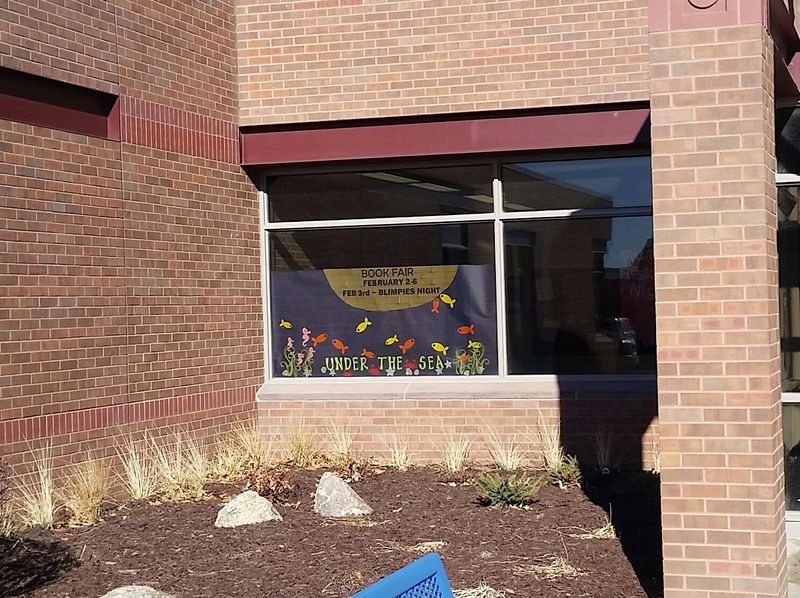 I saw the poster in the front window at school today and had to add this picture!! This week at Let's Scrap Sketches, we have a brand new sketch challenge!! I don't make cards often, so I used the sketch (below) to create a layout. 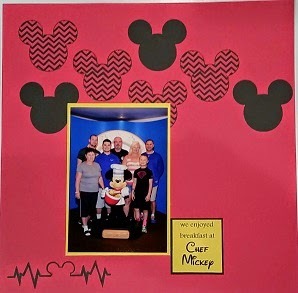 This is a group picture of us at Chef Mickey last November. I used Mickey heads and my Silhouette Cameo to create the background. I tucked in a Mickey heartbeat and a little journal box. This sketch can be used for a card, layout or canvas! Here is how I configured my layout on my Silhouette mat. I hope I was able to inspire you today - consider joining our challenge HERE! Today I am featured at The Buckle Boutique BLOG!!! 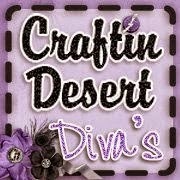 I made a vertical burlap banner that was supposed to be displayed at CHA in The Buckle Boutique booth. Unfortunately, I mailed it to the hotel and they returned it to me. So I will have to display it at my house! 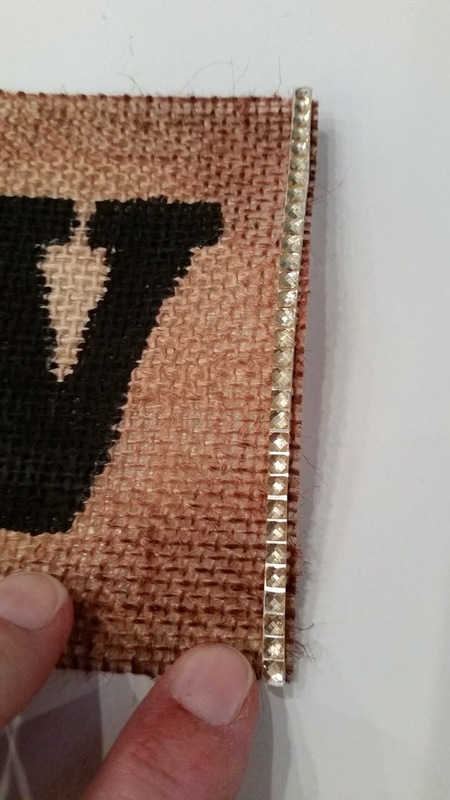 I love burlap with a bit of bling and this was a perfect time to use both together!! 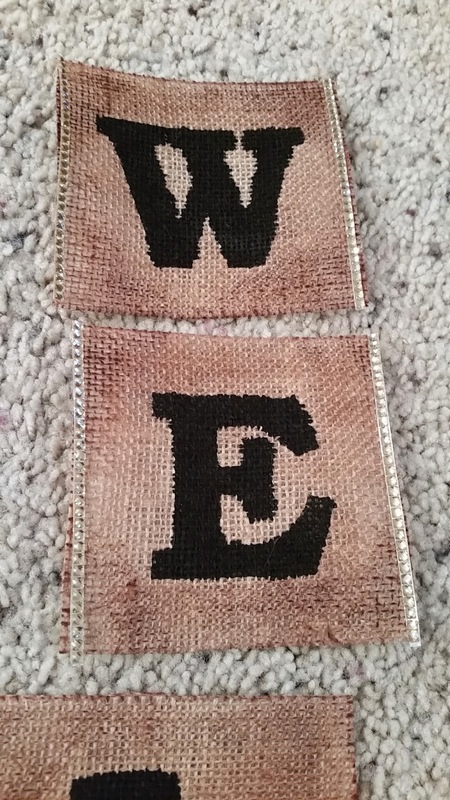 I cut burlap squares 4 x 4 1/4". 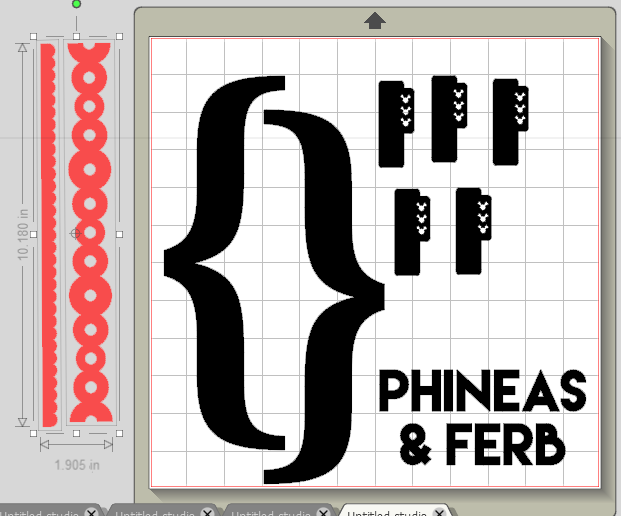 I measured the letters to fit the squares and designed them on my Silhouette program. I cut them out in vinyl to use as stencils. I painted the letters with black acrylic paint and peeled off the vinyl when it was dry. Next I inked the burlap with some vintage photo ink. 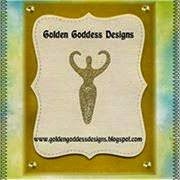 I cut strips of Rhinestone Self-Adhesive Sticker Sheets (found HERE) for the edges of the banner squares. 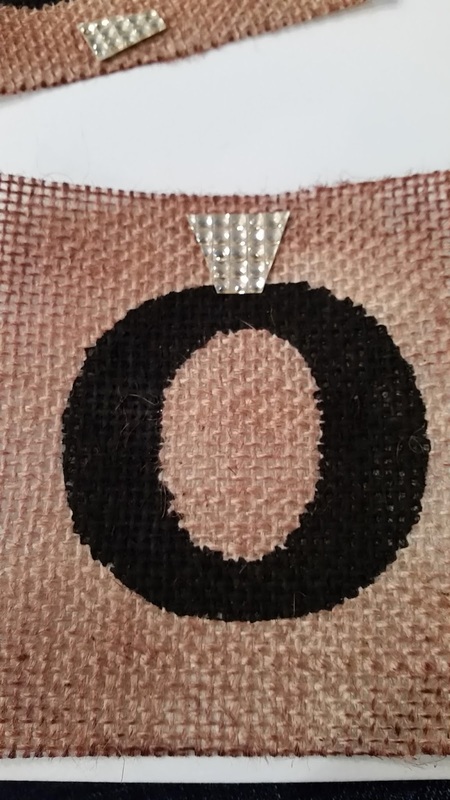 I cut a diamond for the "o" to look like a wedding ring. The Buckle Boutique also sells wedding trims, buckles and slides so I wanted to embrace that! I trimmed the sticker sheet to resemble a diamond! 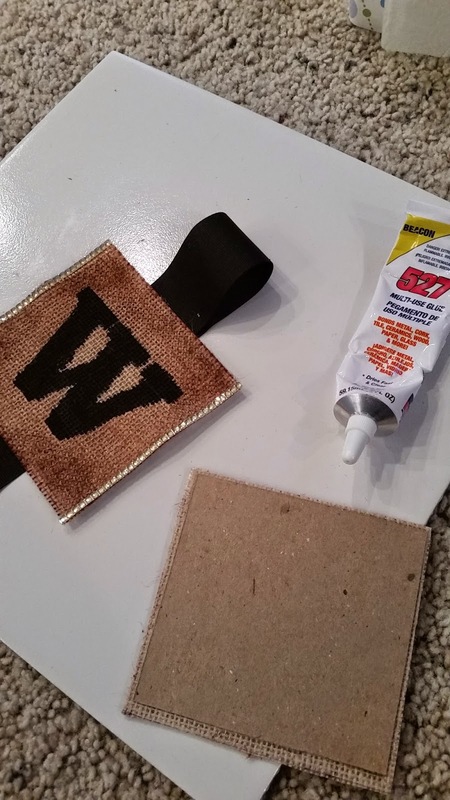 I used Beacon's 527 Adhesive to glue cardstock to the back of the banner squares as well as glue the ribbon to the back of the banner squares to hold the banner together. Here is a close up of the ring! I left the bottom of the ribbon a little long and it can be trimmed if needed. I have made a lot of banners, but this is my first vertical banner! Today starts a new challenge at Frosted Designs! The Challenge is A New (_________). This can be a resolution, goal or event. Have fun with it and join us HERE! We went to Disney World in November. I have a Facebook friend, Melissa, who is a fellow Disney Lover! 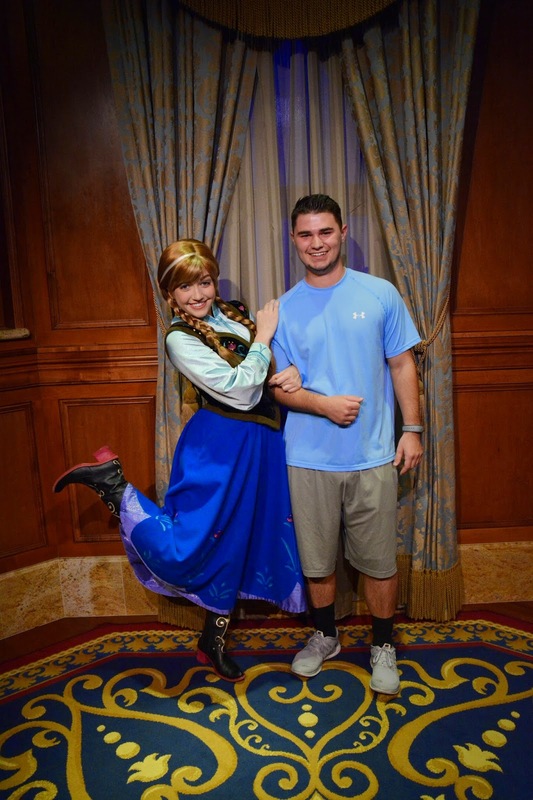 Some people find us Disney Lovers kind of weird - Why do you go to Disney so much? Weren't you just there? Again?!?!? I think we are long lost cousins! Her family moved from Michigan to the Orlando area last summer. She has a son named Tanner who is a year older than my Tanner. The Tanners got to meet for the first time and hit it off right away!! We spend a few hours together on two days of our trip. Melissa and I got to meet in person for the first time - but we have known each other for years! 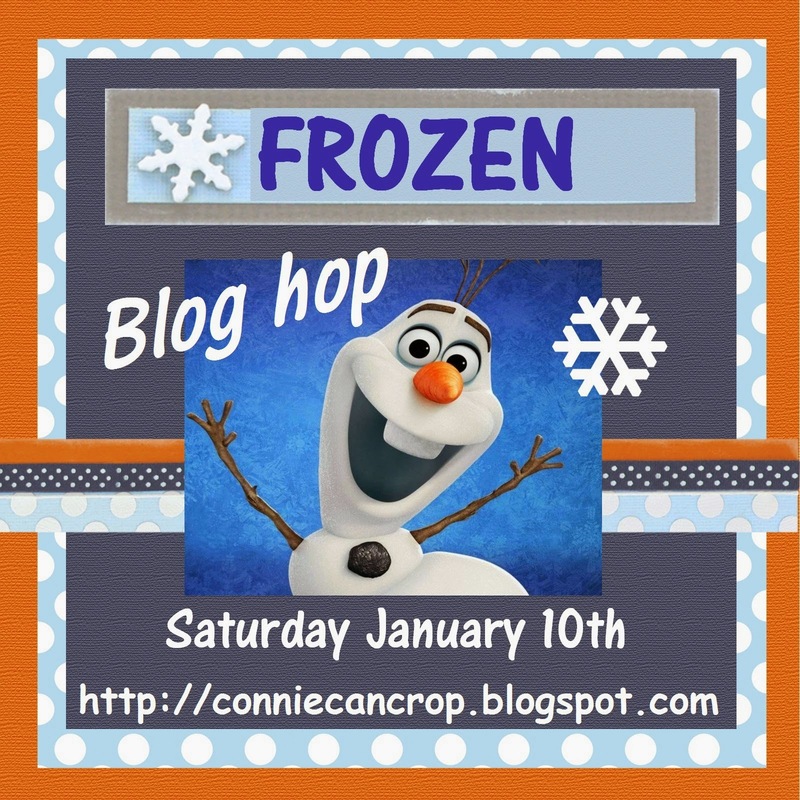 We first met doing Disney/Pixar Blog Hops! Melissa gave us a few pointers. This was our first time at Disney with the Christmas decorations, shows and party. It was perfect in this photo that my Tanner's shirt matched Melissa, and her Tanner's shirt matched me!! 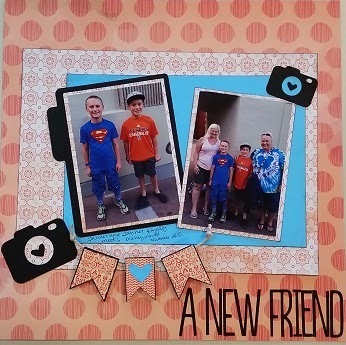 I used orange papers from We Are Memory Keepers (Artisan) and Basic Grey (Fresh Cut) along with blue cardstock. I pop-dotted these banner flags (Naturals wood shapes) after I inked the edges black. I added the little cameras because it was totally a Kodak moment!!! 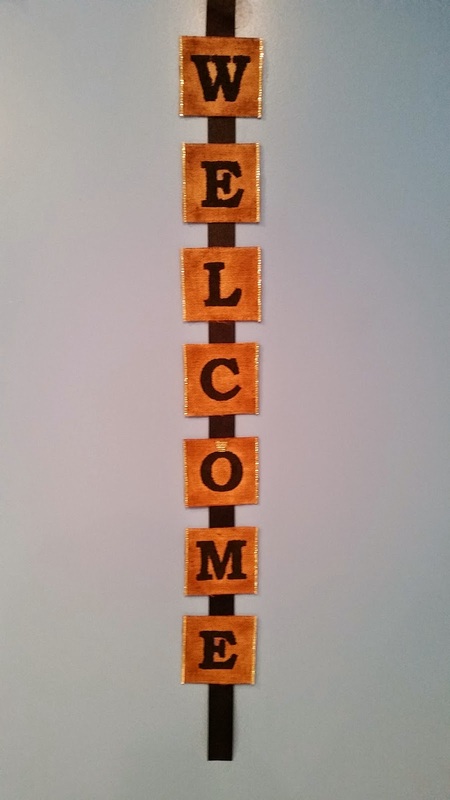 I tucked the title at the bottom with these tall, skinny letters! The boys exchanged information and plan on keeping in touch. Until next time we can come down!! Today starts a new challenge at Let's Scrap Sketches. 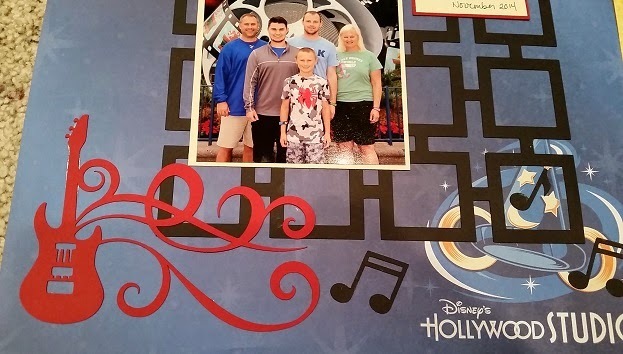 We went to Walt Disney World in November with all three boys and my in-laws. It was the first time in 7 years we all were there together, and sadly may be the last time we are all there together. I hope not but our older boys are 19 and 24 and wanting to go on other adventures. We took this photo in front of the giant Christmas tree in front of Hollywood Studios. 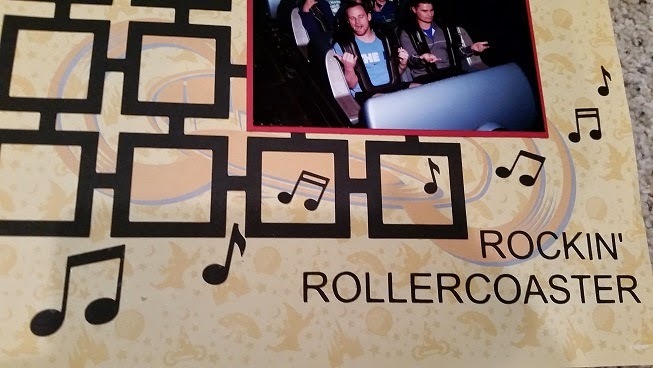 We have been trying to get Tanner to ride the Rockin' Rollercoaster for 3 years. He would get close and then once we got to the line, he changed his mind. His main hang ups were it is inside (and he could not see from the ground what it looked like) and it goes upside down. We got him to ride Space Mountain for the first time this year. Our third trip to HS that week he finally got brave enough to try it. I did not ride just in case he chickened out I could go through the gift shop and get him. He did it and loved it!!! This picture was taken with me and my three boys! Here is the sketch. 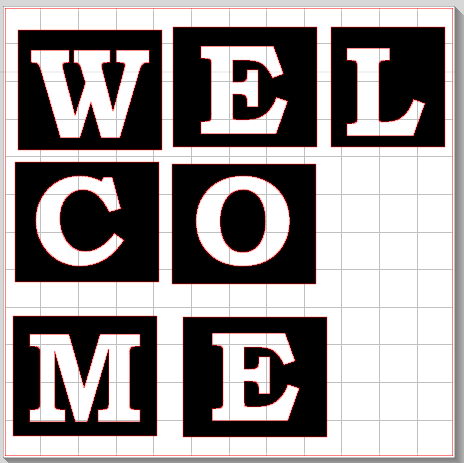 I used a square background from the Silhouette online store and opted to leave the squares empty. 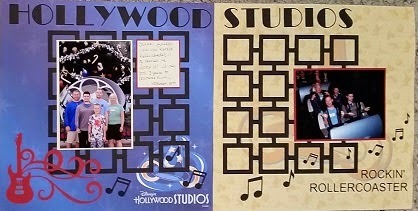 I had some cool Disney papers that I bought on a previous trip to WDW. I wanted the paper to show through. I used Broadway font for the title. I loved this guitar with flourish and added some music notes across the page. I am sad that the Mickey sorcerer hat is being removed from the park this month. I figured I better use this paper before it became obsolete! You can see we are making a fun pose for the camera! My boys are such good sports!! I used Arial for the sub-title font. 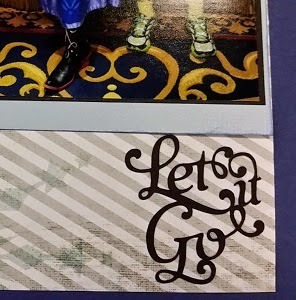 If one of your goals this year is to get caught up on scrapbooking - you may save time using sketches!! We have a new sketch and challenge every Wednesday. You can save the sketch to your computer for future use or join us on our facebook page where we have a library of past sketches! You should have arrived from (INSERT LINK AND NAME). We went to Disney World in November. Tanner turned 9 the day we left. 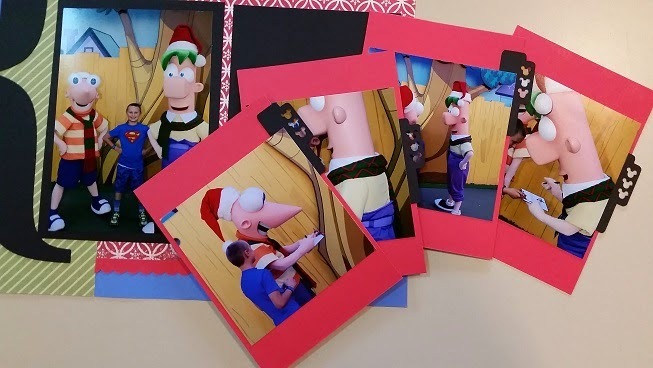 Last year when we went to WDW, he only wanted to see Phineas and Ferb and the characters from our meals. 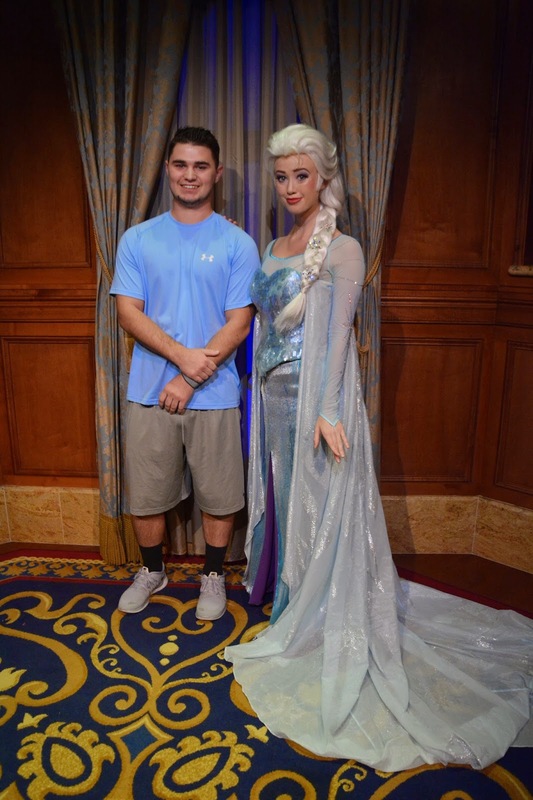 I was surprised that he wanted to see Elsa and Anna. 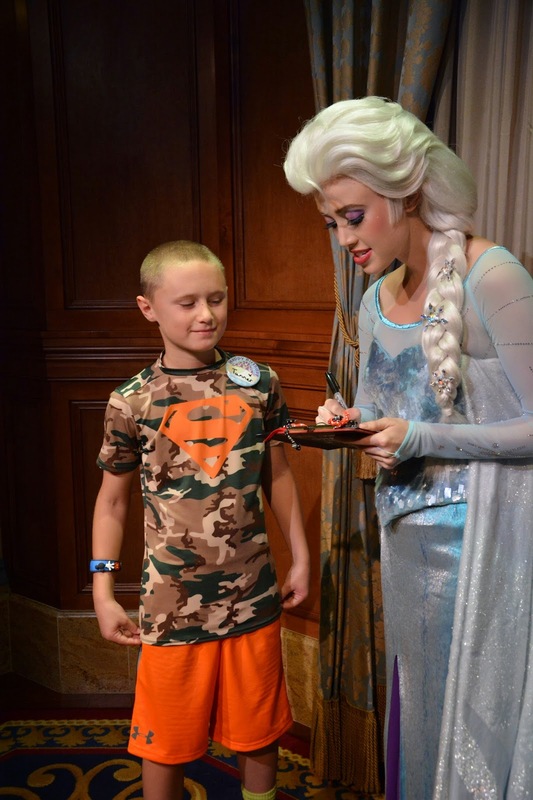 Of course, we did not book a fast pass months in advance to see them because he was more into riding rides than waiting for character autographs. So, we got to the Magic Kingdom right after breakfast with Lilo and Stitch and he wanted to see the wait time. Mind you this was our first full day at MK and he had a list of rides he was hoping to ride. Well, the wait was 90 minutes 20 minutes after rope drop! He insisted on waiting. Mike and his parents went on a few rides while the boys and I waited. His brothers are 19 and 24!!! When we were two families from the front of the line, Tanner asked me what was my favorite part of our vacation so far (on day 3 of our trip) and I said taking Mimi and Papa to eat at Teppan Edo for their first time last night. 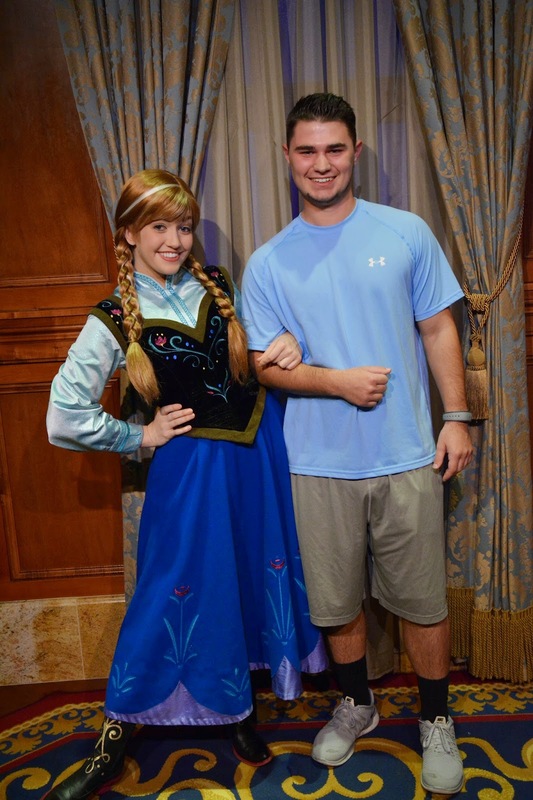 He smiled at me and said seeing for Elsa and Anna was his favorite part of the trip - TOTALLY made it worth the 90 minute wait!!! I spent two days looking for the perfect papers for my post!!! I did not have the right blue in my 3,000 pieces of paper!!! This was my third grouping of paper!! I loved the glittered snowflakes on the paper!! 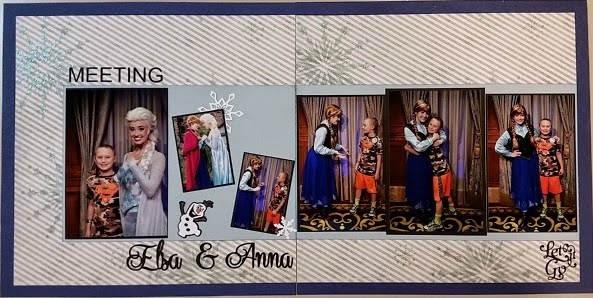 Because I had such good photos of Elsa and Anna, I did not want to cut them out of paper. I did add Olaf though!! 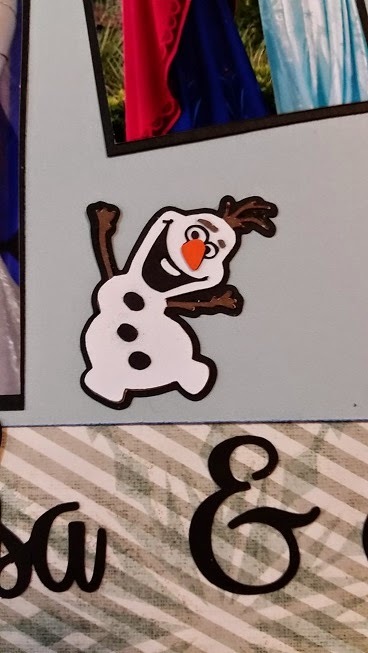 Here is my little Olaf! He was a black and white image that I traced. I got creative with the details, cutting him out in brown and trimming off the white arms and hair. I also cut an extra eyes and nose in orange and trimmed his nose. I used fonts on my computer to cut out my title on my Cameo. 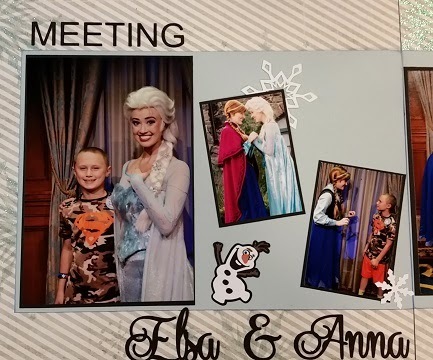 The photo of Elsa and Anna came with my Memory Makers download. Look at the smile on Tanner's face!! 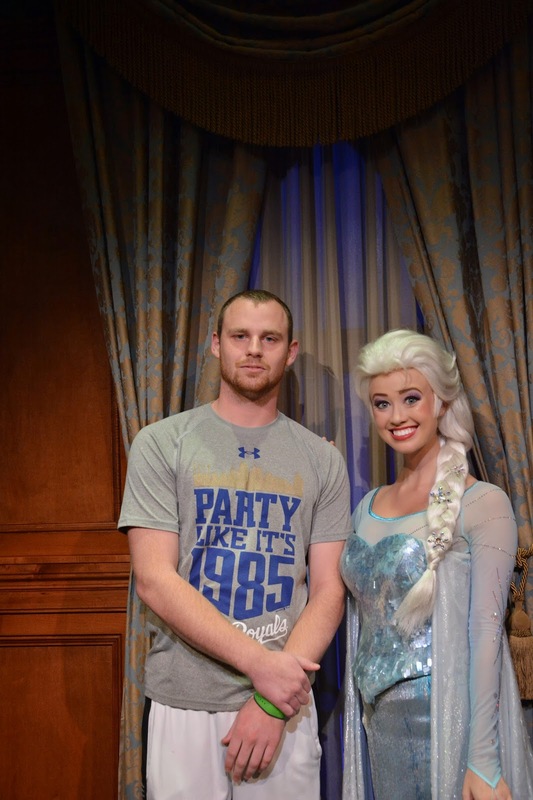 I added a little Let it Go! I had to let the 90 minute wait go!!! Anna blushed and told me Tyler was GORGEOUS! !